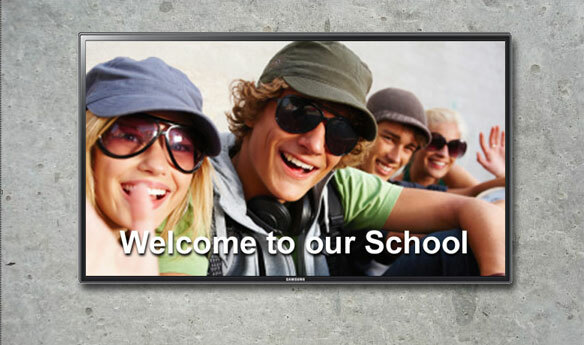 There is an unlimited source of visual material in every school to help promote its image to the market place. This material can also help to create inspirational environments within school spaces that reflect individual and team acheivements of its pupils. Extra curricula activities such as sport, music, drama, arts and community projects generate volumes of media rich content on a regular basis. A media library of photographs, images, videos and audio can be easily assembled for use in a school’s communication channels. Indeed the process of producing, managing and using this media provides a very valuable range of additional skills. It is clearly evident that an innovative learning environment is a key factor in helping to encourage pupils to participate in the ‘community’ aspects of school life. It is certainly receiving higher priority during school inspection visitors. Internal graphic displays are therefore becoming just as important as the prospectus and websites to create the right impression both within and beyond the school walls. More and more schools are using large flat screen displays in their public areas such as the reception, corridors and halls to display announcements, school news and websites etc. Today’s prices of display screens makes a digital signage system a realistic proposition with a 40 inch wall screen and content management software costing less than £ 1000 (even less if the school already has a compatible screen). Additional screens can then be added to display different content according to the location and organised from a single pc with internet access. Once the design layout is in place it is just a question of adding relevant media and text, similar to creating a powerpoint presentation. Still at School can provide an onsite demonstration to show how such a system works and how the content management software can accommodate the user’s skill, from the most basic of layouts to more complex for multimedia and message distribution. It is even possible to prepare content in advance and schedule its display whenever required, whether it is the next hour, day or week and to switch off power to save energy. 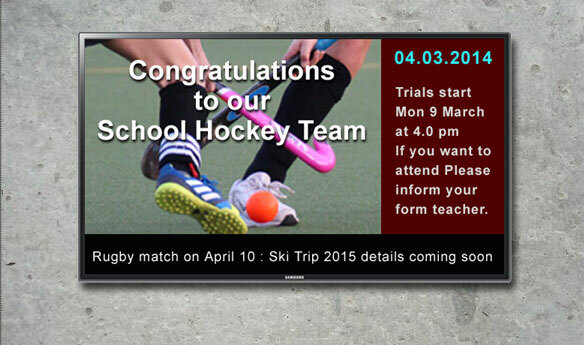 A digital signage system offers an extremely effective means of maximising the potential of the rich media content generated each school day. Individual and team achievements in sports, drama, music, arts and the community can be highlighted to help celebrate and encourage participation by pupils and staff and to project a very effective ‘brand’ image to visitors, parents and the school inspectorate.